I would like to introduce you to Horses for Heroes. This organization does wonderful work for those who serve; be they firefighters, police officers, military or other public service personnel putting their lives on the line for us. The littlest heroes, the children of these men and women, also benefit from the healing and therapeutic power of horses. This entry was posted in Art, Balance, Bliss Tips, Child's perspective, Illustrations, Watercolor and tagged Art, child, Drawing, Grandchildren, horse art, Horses for Heroes, Inspiration, Painting, Sneaking Bliss, Watercolor by MaryALivingston. Bookmark the permalink. Amazing painting. So much emotion. I am so taken that this little boy will approach such a large creature with this much tenderness. Mary this is art is breathtaking! Thank you for sharing about Horses for Heroes. Thank you, Laura. And thanks for stopping by. This is a powerful painting! Horses and kids can make a beautiful bond. And what a great organization. Many years ago My Mom Person was involved with a similar organization using horses to help people with various disabilities. We donated a horse to them. That was sure a special horse. Thanks for sharing this picture. Rhythm, you must have one awesome Mom Person. Thank you for stopping by and for all you do to help children, too. I sure do enjoy my job! What a beautiful painting, Mary! 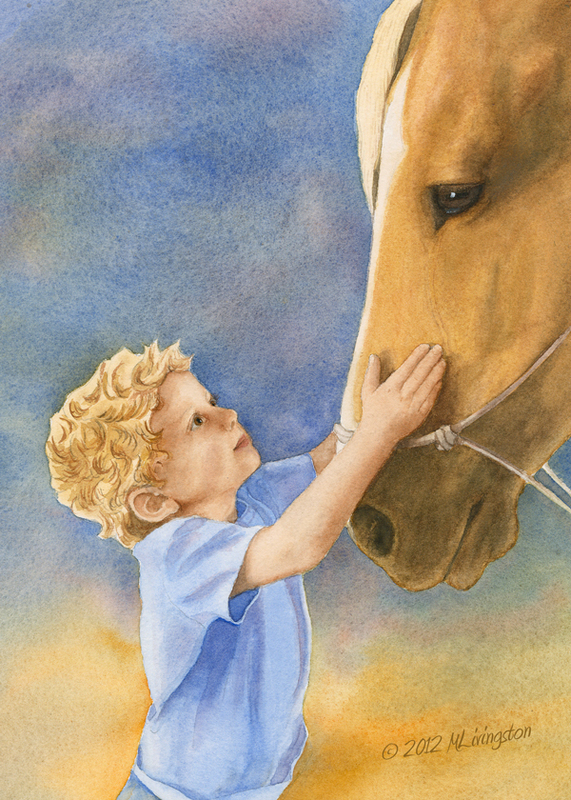 The expression on the boy’s face, and also in the gentle eyes of the horse goes straight to my heart! So beautiful. I love the gentle eye. I am glad it brings fond memories for you. I imagine, someday it will for this little one. Thank you, I am glad their connection shows through. Thank you, Alicia, your comments mean a lot to me. This is amazing! Thank you for sharing this with me. Thank you, it means a lot. I think a limited pallet helps with emotion especially when contrasting colors play into one another. Horses for Heroes touches the hearts of many through their great work. I just love this painting…. I was trying to do watercolour today, and I am just so bad at it…I referred to your watercolours to see how perfectly finished they are…. I have picked up a lot of wonderful tips in an online learning community Make Your Splashes – Make Your Marks! Your comment means a lot to me, I started learning watercolor 6 months ago. The above course and online group has been invaluable in my journey. Thank you so much…I was trying to find a community like that… :)..I will go through it and pick up some watercolor skills…But one’s definitely got to have a steady, patient hand for watercolor i’m sure…. Also I wanted to find out from Tim and you if I can have the permission to try and draw the cute photo of Blaze with your other pet (name I don’t know)…in one of the retriever photos…. Yes, you have our permission, we just ask that you acknowledge the dog as ours if you post it publicly. If you are using a specific photo, just give reference photo credit as I did for this one. Linking back to the blogs would be nice, we might even want to reblog it! let us know if you need names. I think the photo you are looking at is Blaze and Hunter, taken by Tim? And, thank you so much for asking. We look forward to seeing your creation. So Beautiful Mary… Such a pleasure to work with you. Merry Christmas & Blessing for the New Year to you & yours! It was so good to see you! And of course to buy copies of COWBOY THE MAGIC HORSE for my grandkids. They will be SO excited to have autographed copies. Amazingly, Jackie came in before I left, she signed them too!